This past holiday weekend we had two pot-luck cookouts to go to. Since I haven’t been baking for Mr. D. and me, I took this as the perfect opportunity to make a baked dessert, and have just one piece. When I chose this recipe I didn’t foresee how difficult it would be to have just one piece. Holy Moly! Every word in the name of this cake is so true; it’s definitely chocolate, very fudgey, and there is zucchini (and chocolate chips) in it. 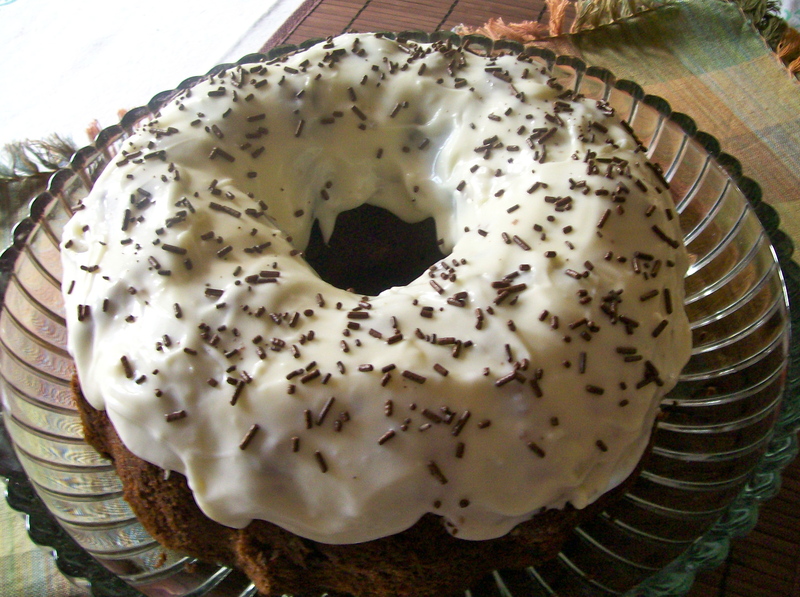 I thought, I’ll just whip up this easy cake in no time, bake it in a bundt pan, and it will travel well, which it did. 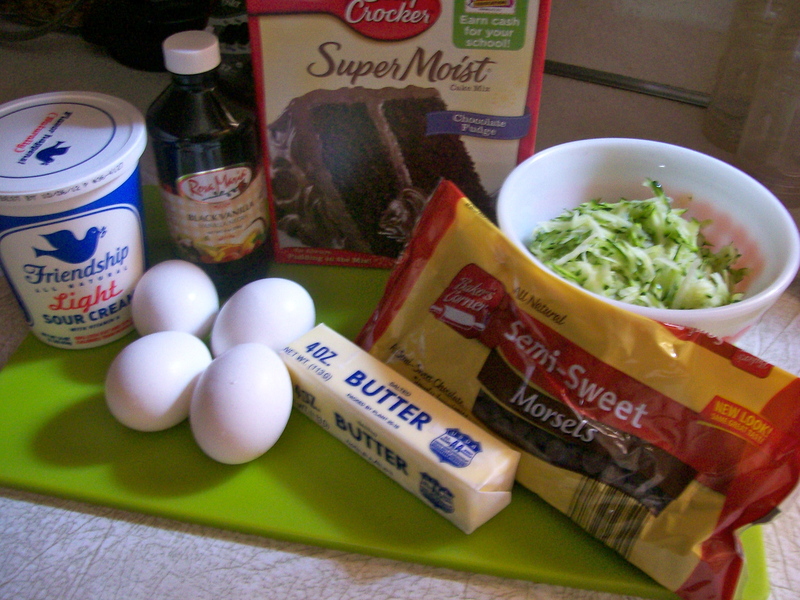 Putting all the ingredients together and making the batter was no problem. Where I got into difficulty was when I licked some of the batter off my finger. Ok, Ok, I went a little further and licked the beaters, what can I say, I do that sometimes! This batter was so thick and creamy, like chocolate pudding, that I wanted to eat it with a spoon. I forced myself to scrape it all into the pan, and put it the oven, and was rewarded with a high, beautiful cake. The recipe suggests an oven temperature of 325 degrees for 40-50 minutes. My cake took the full 50 minutes before it tested done. I just know that if you make this cake you will love it. Besides, it uses up some of that zucchini. 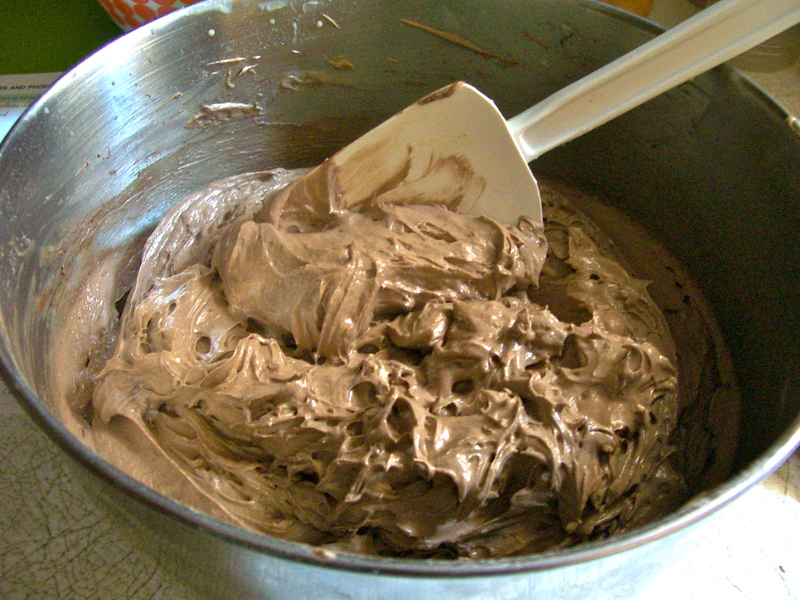 1 Chocolate Fudge Cake Mix with Pudding in the mix. 1. 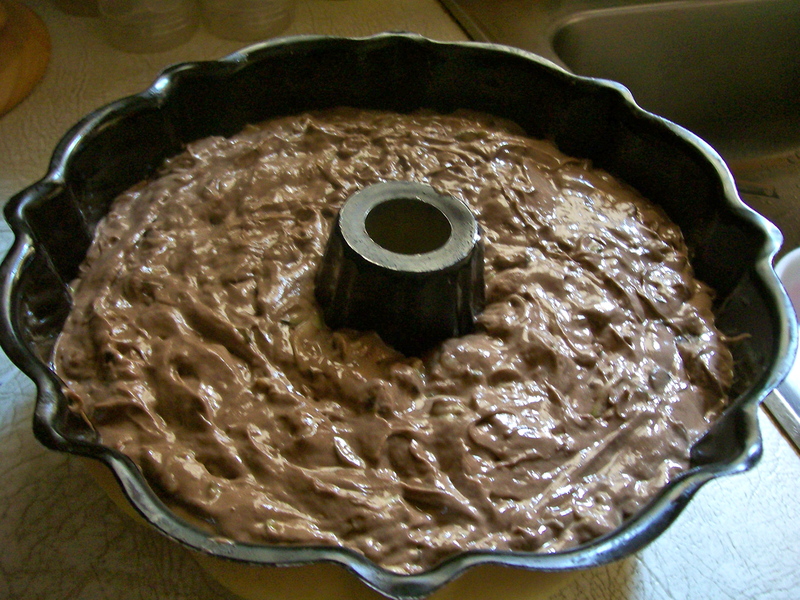 Grease and flour a 12 cup bundt pan or 10-inch tube pan. Preheat oven to 325 degrees. ( 350 degrees for light colored pan ). 2 In large mixer bowl, beat butter till light and fluffy, beat in eggs one at a time, then flavorings. Beat in sour cream and cinnamon, then slowly beat in cake mix. Remove from mixer. 3. 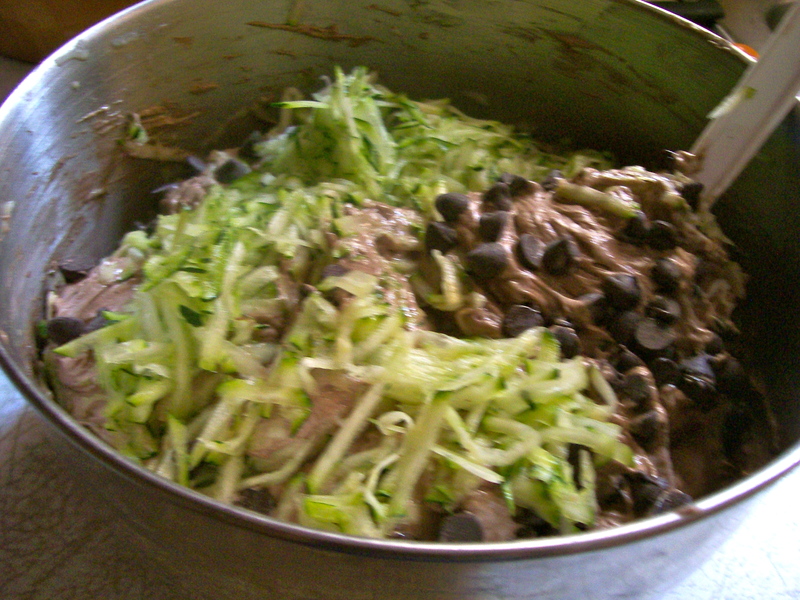 Stir in zucchini, chocolate chips, and nuts if using. 4. Spoon into prepared pan. Bake for 40 – 50 minutes, until tester comes out clean. Cool on cooling rack for about 15 minutes. Invert onto serving plate to cool completely. *** Frost or dust with confectionery sugar. 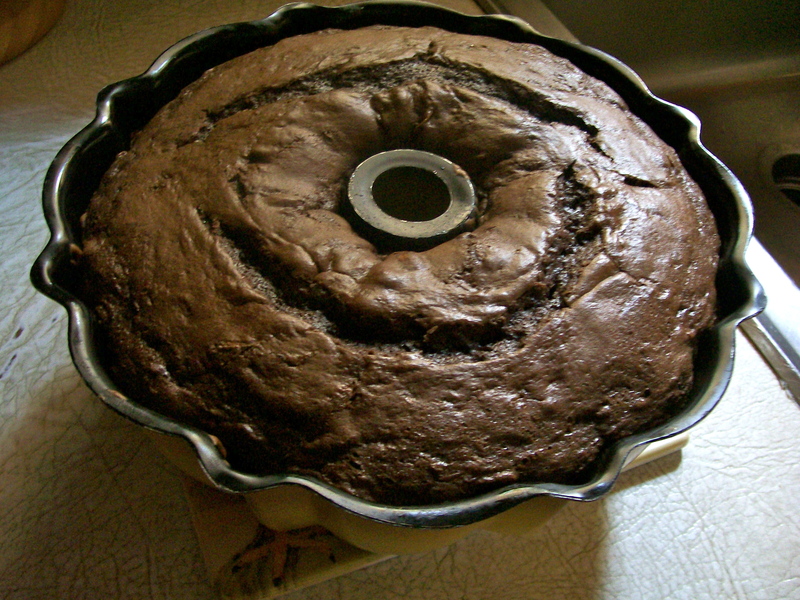 ***This cake is likely to break if you try to remove it from the pan while it is still warm. Ask me how I know! 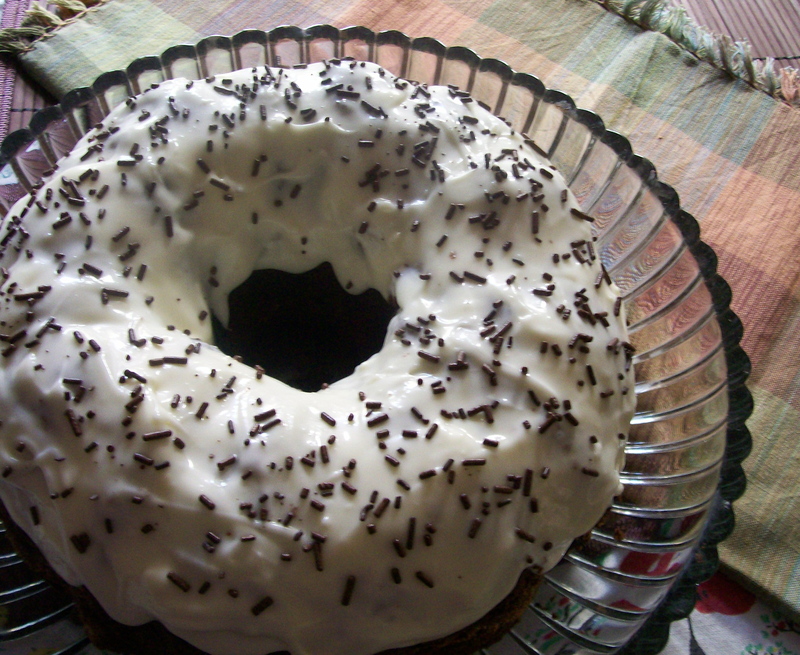 I made a simple frosting of cream cheese, confectionery sugar and milk, in a thin consistency to drizzle over the top. I first used some to glue the cake together where it broke, and then poured the rest over the top and let it run down the sides.